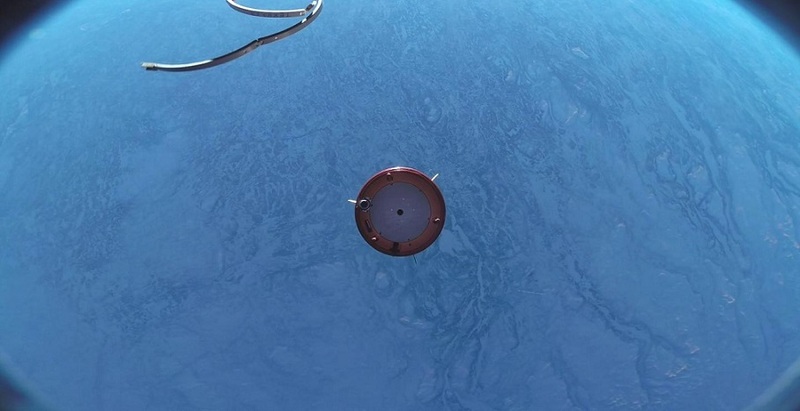 For the first time, an optical clock has traveled to space, surviving harsh rocket launch conditions and successfully operating under the microgravity that would be experienced on a satellite. This demonstration brings optical clock technology much closer to implementation in space, where it could eventually allow GPS-based navigation with centimeter-level location precision. In The Optical Society's journal for high impact research, Optica, researchers report on a new compact, robust and automated frequency comb laser system that was key to the operation of the space-borne optical clock. Frequency combs are the “gears” necessary to run clocks ticking at optical frequencies. Phones and other GPS-enabled devices pinpoint your location on Earth by contacting at least four satellites bearing atomic clocks. Each of these satellites provides a time stamp, and the system calculates your location based on the relative differences among those times. The atomic clocks used on today’s satellites are based on natural oscillation of the cesium atom — a frequency in the microwave region of the electromagnetic spectrum. Optical clocks use atoms or ions that oscillate about 100,000 times higher than microwave frequencies, in the optical, or visible, part of the electromagnetic spectrum. The higher frequencies mean that optical clocks “tick” faster than microwave atomic clocks and could thus provide time-stamps that are 100 to 1,000 times more accurate, greatly improving the precision of GPS. Frequency combs are an important component of optical clocks because they act like gears, dividing the faster oscillations of optical clocks into lower frequencies to be counted and linked to a microwave-based reference atomic clock. In other words, frequency combs allow the optical oscillations to be precisely measured and used to tell time. Until recently, frequency combs have been very large, complex set-ups only found in laboratories. Lezius and his team at Menlo Systems, a spin-off company of Nobel Laureate T.W. Hänsch’s group at the Max Plank Institute for Quantum Optics, developed a fully automated optical frequency comb that measures only 22 by 14.2 centimeters and weighs 22 kilograms. The new frequency comb is based on optical fibers, making it rugged enough to travel through the extreme acceleration forces and temperature changes experienced when leaving Earth. Its power consumption is below 70 watts, well within the requirements for satellite-based devices. The researchers combined their new frequency comb with an atomic cesium clock for reference and a rubidium optical clock developed by research groups at Ferdinand Braun Institute Berlin and Humboldt University of Berlin as well as a group from the University of Hamburg that recently moved to Johannes Gutenberg University of Mainz (JGU). Airbus Defense & Space GmbH was involved in the construction, interfacing, and integration of the payload module that went into space and also provided support and equipment during the flight. In April 2015, the entire system was flown on a research rocket for a 6-minute parabolic flight into space as part of the TEXUS program that launches from the Esrange Space Center in Sweden. Once microgravity was achieved, the system started measurements automatically and was controlled from the ground station via a low-bandwidth radio link. “The experiment demonstrated the comb's functionality as a comparative frequency divider between the optical rubidium transition at 384 THz and the cesium clock providing a 10 MHz reference,” said Lezius. Although the optical clock used in the demonstration had about one tenth the accuracy of atomic clocks used on GPS satellites today, the researchers are already working on a new version that will improve accuracy by several orders of magnitude. The highly accurate measurements made possible with frequency combs could be useful for many applications. For example, space-based frequency combs could improve the accuracy of global remote sensing of greenhouse gases from satellites and could be used for space-based gravitational wave detectors. The researchers plan to fly an improved version of the optical clock into space at the end of 2017. In that experiment, the frequency comb module will not fly under a pressurized dome in order to test how well it works in the vacuum conditions that would be experienced on a satellite. The researchers also seek to further improve the system’s resistance to harsh cosmic radiation to ensure that it can operate for several years in orbit. Within a few years, Lezius and his team aim to have a space-qualified frequency comb module that the space community can use in future missions and applications. They are aiming for a device with a volume of about 3 liters that weighs a few kilograms and has a power consumption of approximately 10 watts.